We’ve just described how to get a more effective checkout success page, and now it’s time to say a few words about improved newsletter popup. You can easily improve the default popup window with the help of the Newsletter Popup Magento 2 extension by Plumrocket. Offer discount codes, integrate Facebook and MailChimp, add popup triggers and animations, display rules, and implement other improvements with the help of the module. Below, we describe its core features and provide a full backend tutorial. Let’s start with enhanced design opportunities provided by Plumrocket. 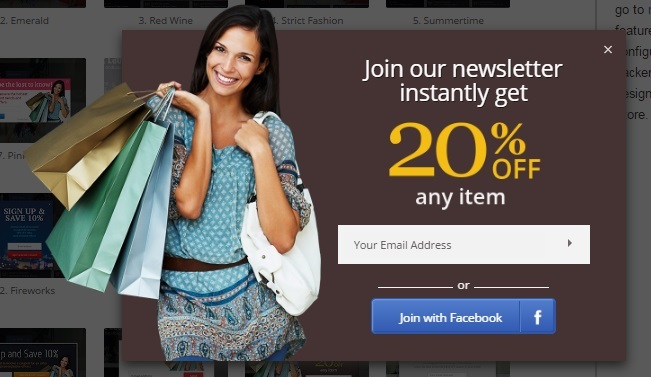 When you purchase the Newsletter Popup Magento 2 module, you not only get a bunch of features but also 20+ amazing templates for your newsletter popup. Thus, it is no longer a problem to select the appearance that fully matches your current store design. Besides, all these templates can be customized right from the backend. As a Magento 2 administrator, you can enable/disable certain fields and preview changes. Furthermore, Plumrocket allows you to create your own templates! It is also necessary to mention that the Plumrocket Newsletter Popup Magento 2 module makes the subscription procedure as easy as possible: store visitors can subscribe using their Facebook or Twitter accounts. The email address is retrieved from the social network account automatically. Your customers no longer have to enter a full email address. Instead, they can subscribe in just one click! 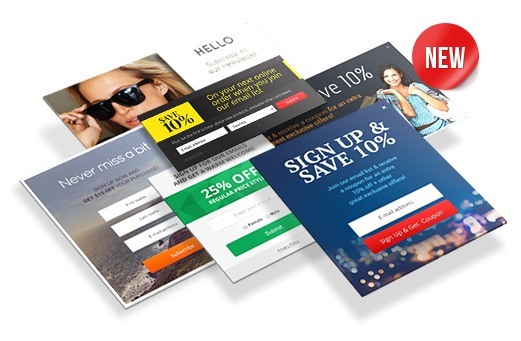 To choose the most effective newsletter popup, you can run A/B tests. Furthermore, the Plumrocket Newsletter Popup Magento 2 extension allows tracking impressions, conversions, and total revenue. All these and other stats are available in the backend. Besides, there are lots of backend settings that allow you to customize the display of the popup fully. For instance, there is a selection of parameters to choose from that trigger the popup window. Furthermore, you can display the popup depending on a customer group, device type, brand, category, and even product. As for the mentioned Mailchimp integration, Plumrocket allows you to save newsletter subscribers right to the MailChimp account. At the same time, you can still collect them in the Magento 2 database. Another Mailchimp-related feature is related to extended user data that can be sent right to the platform. 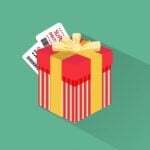 Even coupon codes can be provided to the service for further usage in transactional emails and newsletters. Another important feature we’d like to draw your attention to is a complete history of user interactions with the popup window. Of course, the appropriate grid displays the number of successful subscriptions. 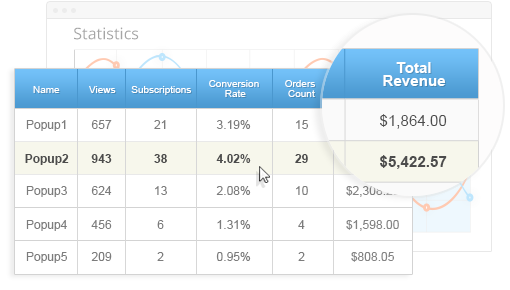 Besides, you can view a corresponding orders number and revenue subtotal. Also, due to various display options (including all possible store locations), the extension provides enough data to find the most effective subscription parameters: landing pages, subscription time, display settings, and more. Blacklists are also among strong features of the Plumrocket Newsletter Popup Magento 2 module. First of all, there is a built-in list of disposable email address services, so subscribers with the related email domains are always rejected. Besides, you can create your own blacklists in the backend section of the extension. Also, note that Newsletter Popup for Magento 2 supports all third-party Magento 2 themes. Thus, you can integrate the module with any custom solution without headaches. 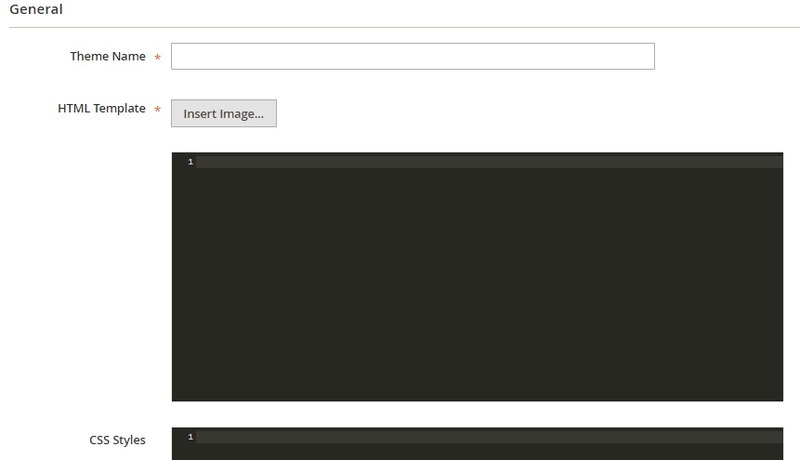 Let’s see how the extension works and feels from the backend. 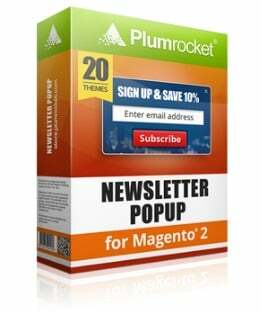 With the Plumrocket Newsletter Popup Magento 2 extension, you can create as many popups as you need. Appropriate settings are located under Plumrocket -> Newsletter Popup -> Manage Popups. There is a grid here that shows popup thumbnail, ID, name, views, subscriptions, conversion rate, orders count, total revenue, start and end dates, store views, and status. Besides, there is a Preview button here. Let’s create a new popup to discover all opportunities provided by Plumrocket. Get ready for a long journey, since this procedure is divided into 4 tabs with lots of settings in each of them. 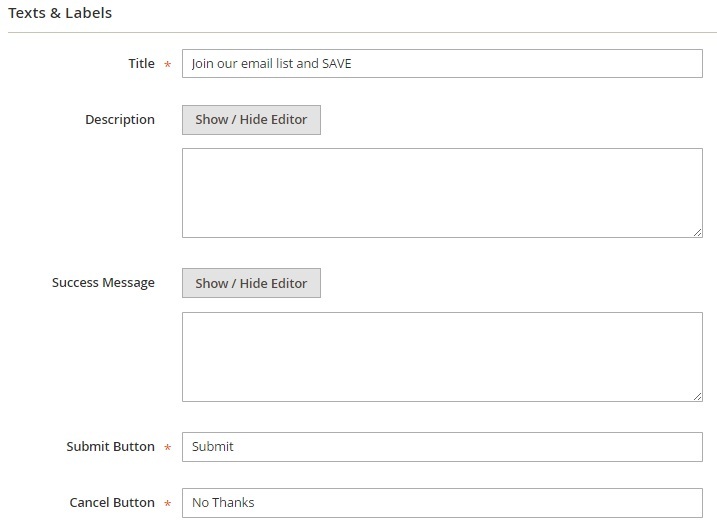 In the General tab, specify the name of your new popup, select its status, decide whether to use coupon codes or not, set the start and end dates, select a subscription success page (we recommend you to use “Stay on current page” option), and decide whether to send an autoresponder email. If you choose to send it, select an email template. 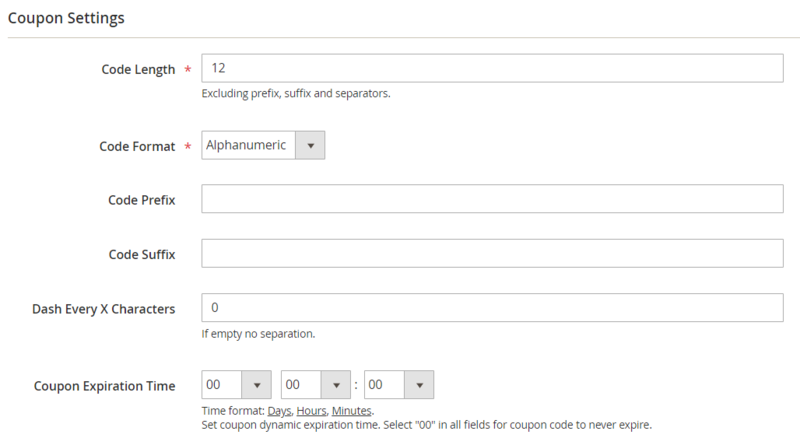 Next, customize coupon codes. Specify length, format, prefix, suffix, the number of dashes, and their placement for a code, as well as its expiration period. 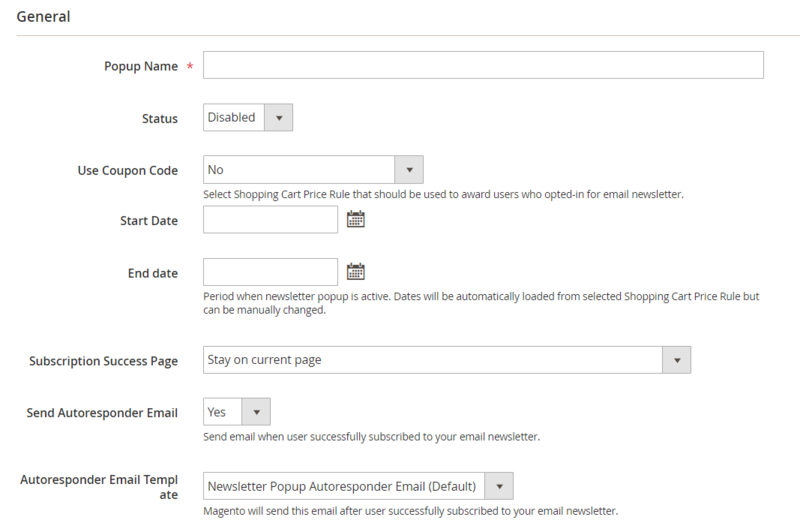 In Signup Form, you can activate email newsletter signup only or add a registration form. 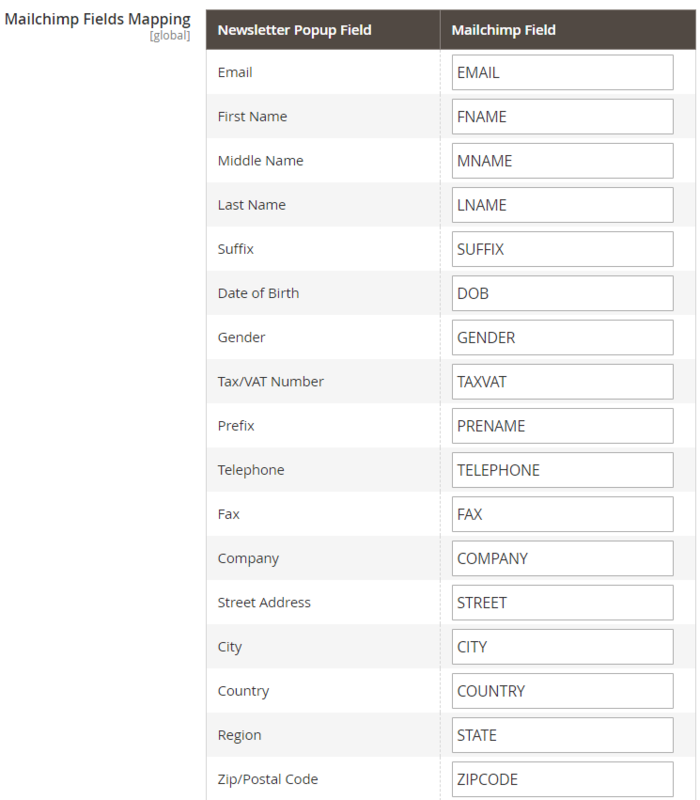 Besides, there is a huge list of parameters that can be added to the form. 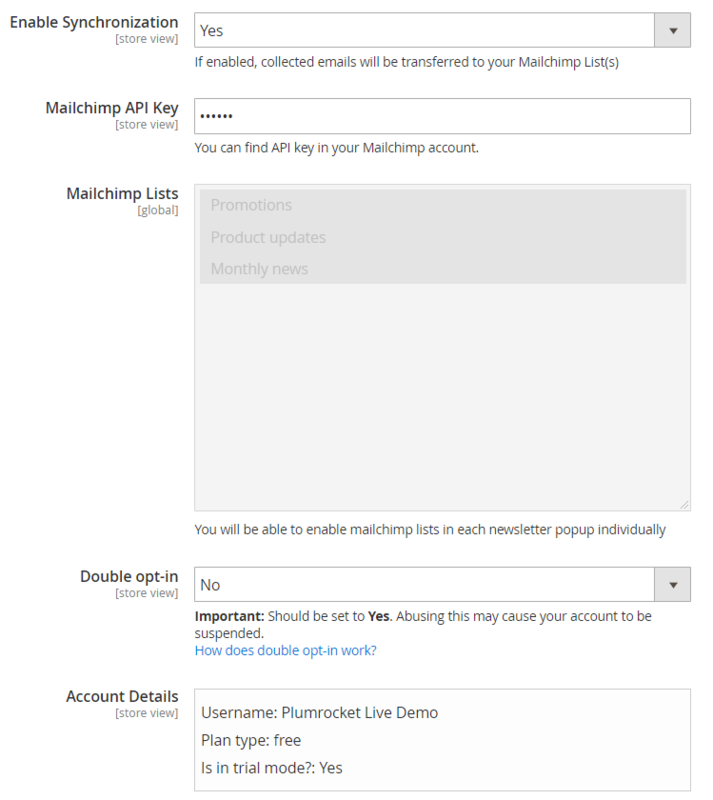 In Mailchimp List Management, you can enable MailChimp lists and select user subscription mode for them. It is possible to subscribe customers automatically or let them choose one or several lists to subscribe to. That was only the first tab, so let’s proceed to the second one – Display Settings. 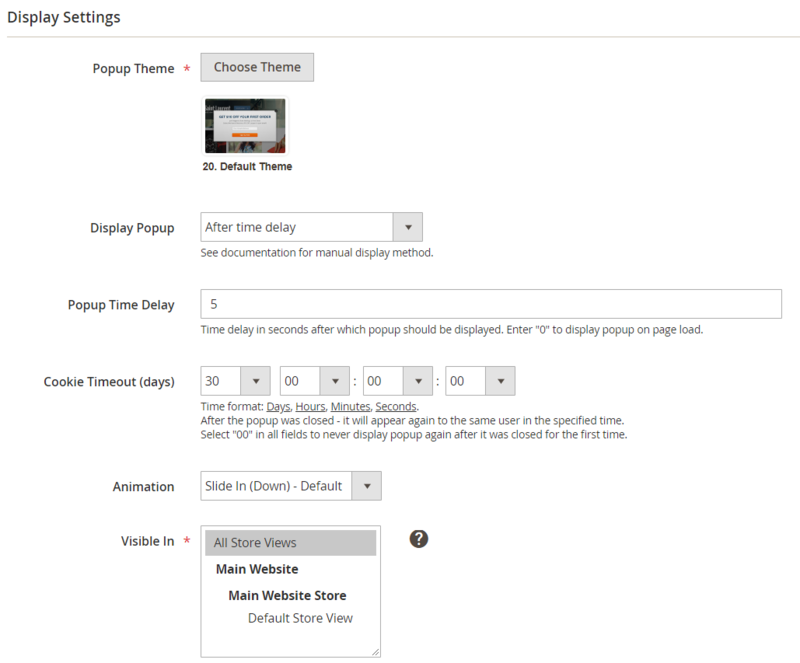 Here, you can select a popup theme, specify popup display mode (after time delay, when leaving site, on page scroll, on mouseover, on click, or manually) and its parameters, add cookie timeout, select animation effect, and store views where to display the popup. Besides, it is possible to create a list of popup restrictions. For example, the extension allows you to disable mobile popup on desktop and tablet devices. In Texts and Labels, you can specify a popup title and description, as well as success message and text for Submit and Cancel buttons. In Theme Template, the Plumrocket Newsletter Popup Magento 2 Extension allows users to customize HTML template and CSS styles. Now, let’s take a look at available themes. You can find them under Plumrocket -> Newsletter Popup -> Manage Themes in a grid. The grid shows a theme thumbnail, ID, name, time when it was updated and created, and type (default theme or my theme). Besides, you can preview or edit themes. 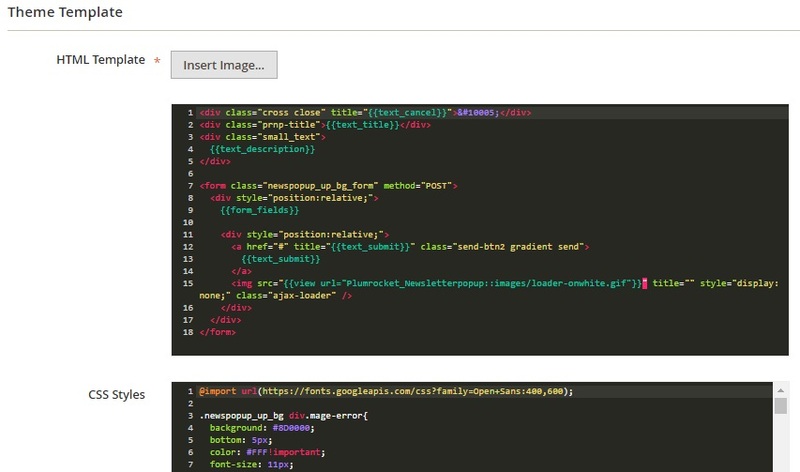 While adding a new theme, you specify its name, insert image, and add custom HTML template and CSS styles. The newsletter popup history is available under Plumrocket -> Newsletter Popup -> History. The appropriate grid shows the following data: popup ID and name; customer name, email, group, and IP; landing page; action (canceled or subscribed); coupon code; order number and G.T. ; date and time; store view. All newsletter subscribers are gathered in a grid under Marketing -> Communications -> Newsletter Subscribers. The final part of our Magento 2 backend tutorial is related to the extension’s configuration. Main settings include Newsletter Popup and Twitter & Facebook Login tabs. The first tab is divided into 4 sections: General, Mailchimp Synchronization, Device Screen Sizes, and Disposable Emails. In the first one, enable the extension and enter a serial key. 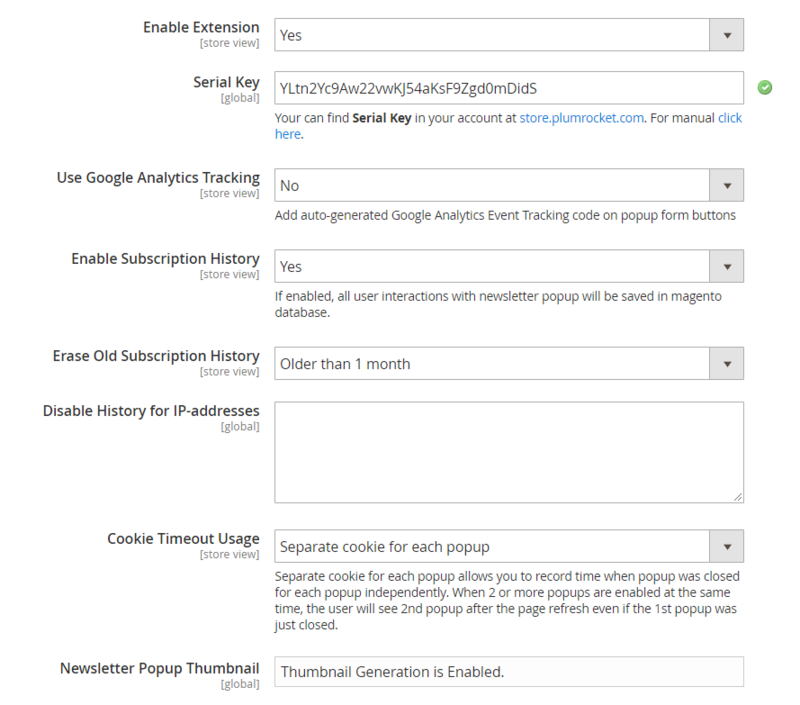 Next, you can enable/disable Google Analytics tracking and subscription history, create a list of IP-addresses for which to disable the history, specify the way cookie timeout will be used (globally for all popups or separately for each one), and configure thumbnail generation. In Mailchimp Synchronization, it is possible to enable/disable the feature, enter your API key, select MailChimp lists, allow double opt-ip, and view account details. 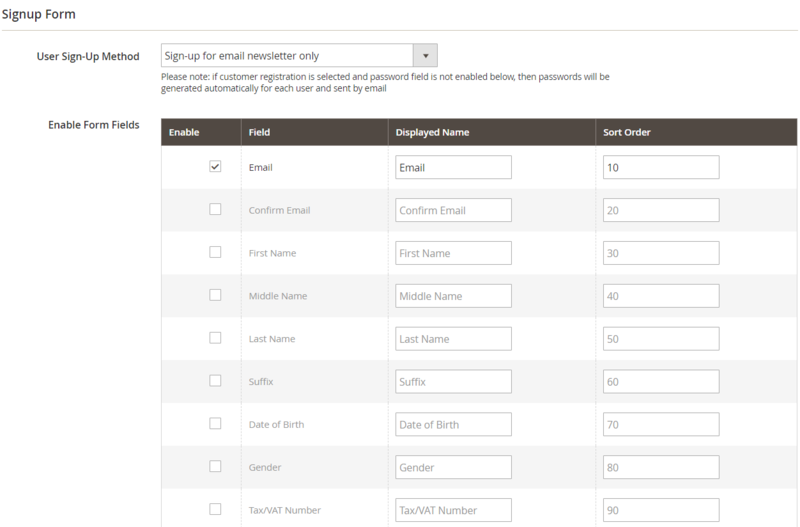 Here you also configure MailChimp fields mapping. Next, specify screen sizes for desktop, tablet, and mobile devices. 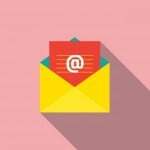 In Disposable Emails, you can reject subscriptions from the list of disposable addresses. Could you imagine that a tiny newsletter popup has such a wide variety of settings? We couldn’t, but now we know a tool for the most customizable popups – Plumrocket Newsletter Popup Extension for Magento 2. The price of the module is just $149, so don’t give it the go-by. The appropriate M1 extension is even cheaper – $99.